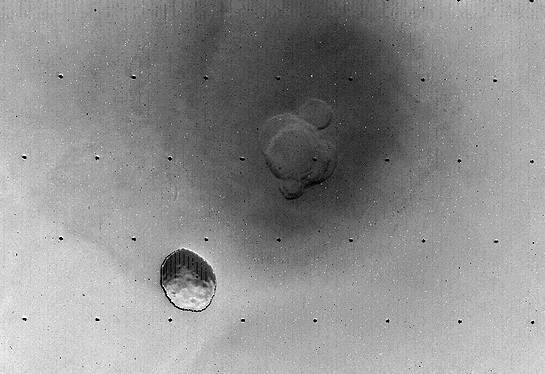 Explanation: Hurtling through space a mere 3,000 miles above the Martian surface, the diminutive moon Phobos (below and left of centre) was imaged against the backdrop of a large shield volcano by the Viking 2 Orbiter in 1977. This dramatic picture looks down from the Orbiter's viewpoint about 8,000 miles above the volcano, Ascraeus Mons. Phobos itself is 5,000 miles below the Orbiter. North is toward the top with the Sun illuminating the scene from the South (black dots are reference marks). For scale, Ascraeus Mons is about 200 miles across at its base while asteroid sized Phobos is about 15 miles in diameter. In this spectacular moon-planet image, volcanic calderas (craters) are visible at the summit of Ascraeus Mons -- while impact craters on the sunlit side of Phobos' surface can also be seen!